In the need for more kitchen appliances? Here's one to help fill up your counterspace. Open to US residents only, you have through 12/21 to enter. Good luck. The Auto-IQ technology isn’t new to Ninja, I have the bigger blender that has it, and I love it. You don’t have to guess how long, or what speed. Everything you need is right there at your fingertips. 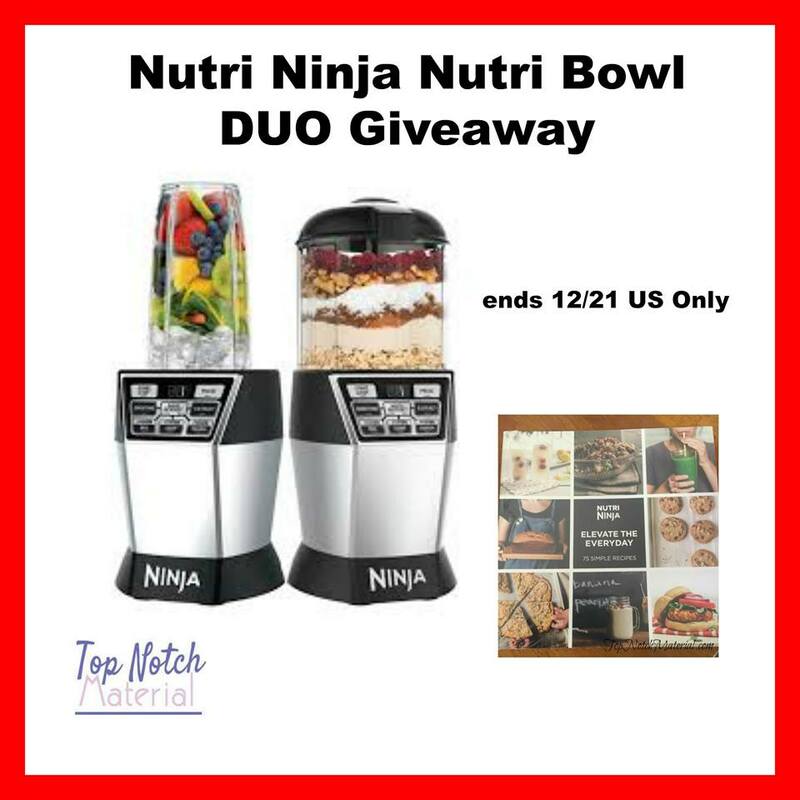 Check out Katrina’s Review on Top Notch Material of the Nutri Ninja Nutri Bowl DUO with Auto- IQ Boost. What Ninja did, was combine two different systems into one. You still have their iconic “cup” type system, but you also get a 4 cup bowl. This allows you to process larger items and more than you would have been able to do with the cup. To me it acts more like a food processor, but way more and does more. One lucky winner will receive their own Duo. Please follow the Giveaway Tools below for your chance to win. I love that it seems I can blend anything and everything in these! I love the basic banana strawberry smoothie. Banana and flaxseed are my fav. I like the bowl option. I like the size of the machine. Our favorite smoothie to make is a blueberry pineapple smoothie with chia seeds. I like how much stuff you can make in it. I like blueberry smoothies. I like that it has the bowl and cup attachments. I love smoothies with peaches, blueberries and bananas. Thank you for the chance to win! Want to win. This cleans so easily and appears almost idiot proof! You can make almost everything imaginable with this Ninja! I like that it has the 4 cup bowl. The fact that it will let me process larger items is great! My smoothie would consist of a banana, almond milk, chia seeds, bluberries & honey. I like the one year warranty and my smoothie would be strawberry and banana. I like the Auto-IQ technology. My favorite smoothie is watermelon and vanilla yogurt. What I like most about this machine is that it completely pulverizes the smoothie ingredients. My favorite smoothie to make is Banana, milk, vanilla ice cream or vanilla yogurt, and ... fresh parsley (puree the parsley first), plus a little salt to taste. I think I could make just about anything with this! I love the dough blade - could even make bread and cookies! I make a spinach, greek yogurt and banana smoothie. I, too, am a fan of the Auto-IQ technology. It just makes everything so much easier! I love the size and the motor speed. I would love to blend up some mocha frappes with it! However, my favorite smoothie to make is banana and peanut butter. I like the size as well as the motor speed. I like to make strawberry smoothie. I have always loved putting bananas, strawberries, orannges, kiwi and kale in mine. I like that you get both a cup and a bowl. My favorite smoothie is greens and banana. i like the cup and bowl attachments. My favorite smoothie to make is strawberry banana. I've always been intrigued by this blender, but it is out of my price range. I like strawberry smoothies. i like that there are specific buttons for what you want to do. to make the smoothie more like a smoothie or make it into a juice!!! my favorite smoothie is apple ginger and creamscile! i would love to try a strawberry smoothie with this. i love that it does it all. one appliance that can do so much is great. I would definitely use this the most for smoothies. I like to mix things up with different fruits and veggies. Sometimes I do mixed berries, 1/2 banana, peach slices, ground flax, and vanilla whey protein powder. I also like the tropical blend of fruit from Aldi's that includes strawberries, peaches, pineapple, and mango. I use the tropical blend with banana, flax, and sometimes throw in some blueberries too. I like the 1200-Watt Motor Base with Auto-iQ Boost. I would make a mixed berry smoothie with flax seed and protein powder. 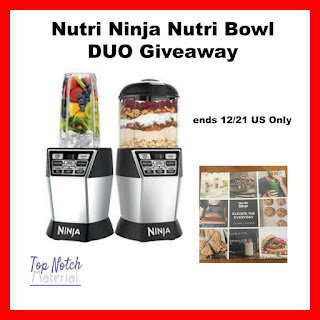 I love that it comes with the nutri bowl also. My favorite smoothie is banana strawberry peanut butter. I love that it can mix/blend pretty much anything! I love a good strawberry smoothie! I love the size of the machine and the bowl option, my favorite smoothie is banana strawberry! So good!